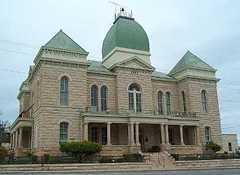 Crockett County Courthouse, Ozona, Texas. 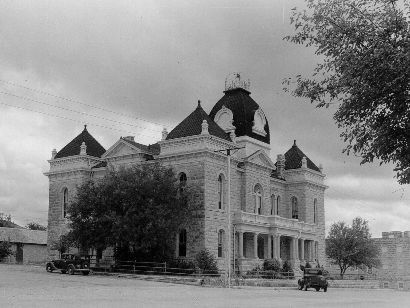 According to Courthouses of Texas by Mavis Kelsey, Sr. and Donald Dyal, there had been faux clock faces painted on the main tower. The building is described as a Second Empire design, with the architect being one of the Ruffini Brothers. 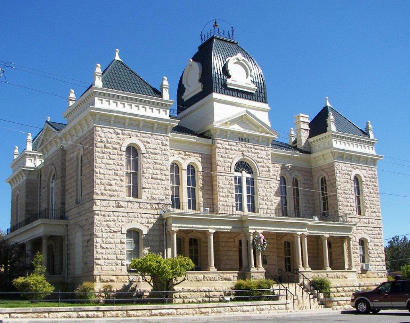 In this case it was Oscar, who was also responsible for neighboring Sutton County Courthouse. Brother F.E. 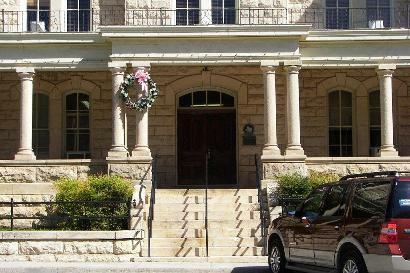 designed the Concho County Courthouse in Paint Rock. 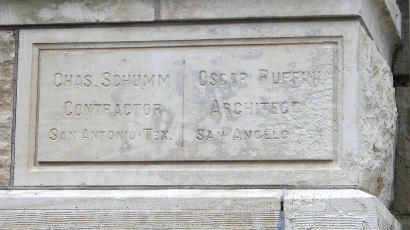 Oscar also designed the Ozona High School. 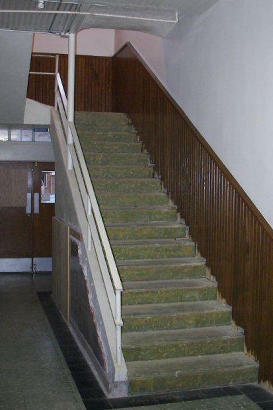 Built 1902. 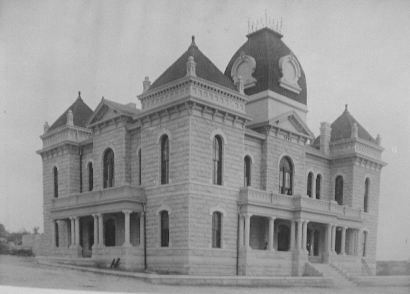 Second courthouse for county. 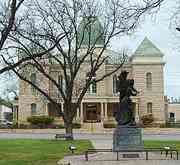 American Gothic architecture, planned by Oscar Ruffini, San Angelo. Material is fine stone quarried nearby on Meyer and Couch properties. Cost $30,000. Early day community social center. Used for cowboy dances, box suppers, Christmas trees, roundup celebrations. 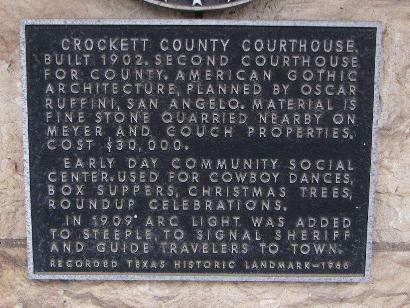 In 1909 arc light was added to steeple, to signal sheriff and guide travelers to town. 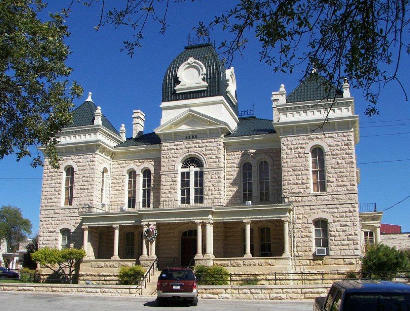 "During my visit to Ozona in December of 2009, I found the courthouse in a state of restoration. The roof was pretty much finished with a noticeable color change to the Mansard cupola over the front entrance and the pyramidal caps on the corner pavilions. 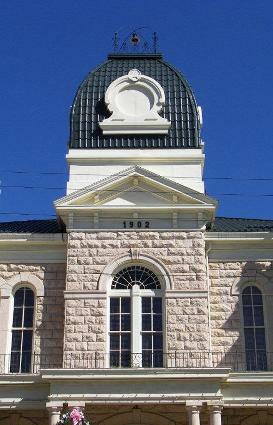 Another restored feature included the �bulls-eye� or �ox-eye� moldings on the Mansard cupola, ostensibly for clocks that were never installed. 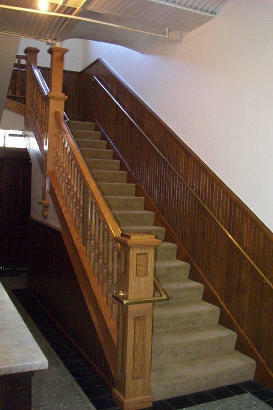 The original moldings had been removed some time ago. 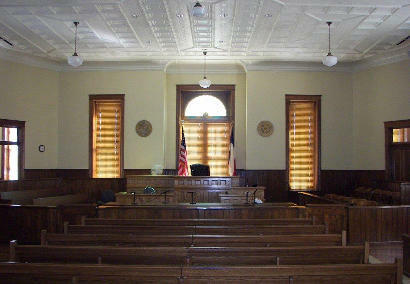 The interior was still mostly untouched and construction crews were busy building new furniture for the upstairs courtroom. 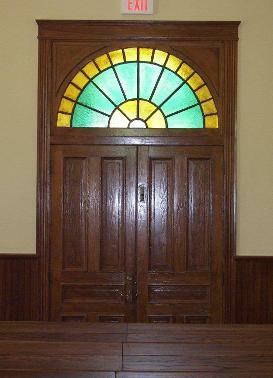 Courtroom doors from inside the courtroom.